Learning in online environments has the potential to better classroom instruction in many avenues. In this context, this article presents two novel technologies, first, a method to causally model learner competencies, both conceptual and metacognitive, and second, a method to identify learning styles of individual learners. We contend that in both cases it would be extremely difficult for human instructors to thoroughly understand the competencies and competency developments of individual leaners as well as the individual learning styles and changes to learning styles. We further contend that these two technologies, as part of a singular framework, will assist classroom instructors to complement their understanding of competencies and learning styles of their classes, respectively, and facilitate instructions to be adapted at various levels of granularity. Kumar, V., Graf, S. & -, K. (2011). Causal competencies and learning styles: A framework for adaptive instruction. 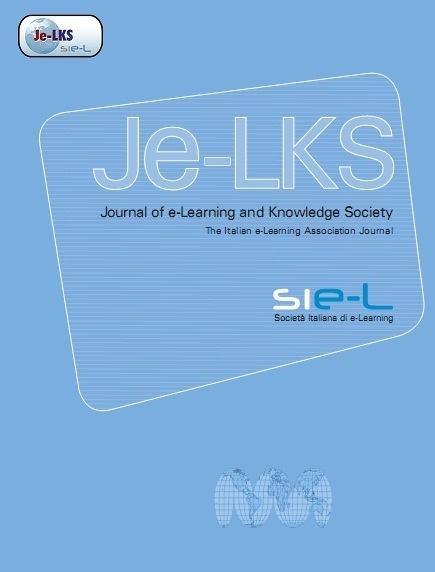 Journal of e-Learning and Knowledge Society, 7 (3), 13-32. Italian e-Learning Association. Retrieved April 20, 2019 from https://www.learntechlib.org/p/43495/. Pearl J. (2000), Causality: Models, Reasoning, and Inference, Cambridge University Press. Spirtes P., Glymour C. & Scheines R.. (2000), Causation, Prediction, and Search, The MIT Press, 2nd edition. Samsonovich A.V., de Jong K.A., Kitsantas A., Peters E.E., Dabbagh N. & Kalbfleisch M.L. (2008), Cognitive Constructor: An Intelligent Tutoring System based on a Biologically Inspired Cognitive Architecture (BICA), in: Wang P., Goertzel B., Franklin S. (eds), Frontiers in Artificial Intelligence and Applications, Proceedings of the first AGI Conference, ISBN 978-1-58603-833-5, 311-325. Boekaerts M., Maes S. & Karoly P. (2005), Self-regulation across domains of applied psychology, Applied Psychology: An International Review, 54 (2), 149-154. Azevedo R., Cromley J.G., Winters F.I., Moos D.C. & Greene J.A. (2006), Using computers as metacognitive tools to foster students’ self-regulated learning, Technology, Instruction, Cognition, and Learning Journal, 3, 97-104. Biswas G., Roscoe R., Jeong H. & Sulcer B. (2009), Promoting self-regulated learning skills in agent-based learning environments, in Proceedings of the 17th International Conference on Computers in Education, 67-74, Hong Kong, Asia-Pacific Society for Computers in Education. Cook T. (2001), Randomized experiments in education: A critical examination of the reasons the educational evaluation community has offered for not doing them, Educational Evaluation and Policy Analysis, 24, 175–200. Winne, P.H. & Hadwin, A.F. (1998), Studying as self-regulated engagement in learning, in: Hacker D., Dunlosky, J., Graesser A. (eds. ), Metacognition in Educational Theory and Practice, 277-304, Hillsdale, NJ, Lawrence Erlbaum. Zimmerman B.J. (2002), Becoming a self-regulated learner: An overview, Theory Into Practice, 41, 64-71. Rao S. & Kumar V. (2008), A theory-centric realtime assessment of programming, in: Proceedings of IEEE.s International Conference on Advanced Learning Technologies (ICALT.08), 139-143. Shakya J., Menon S., Doherty L., Jordanov M. & Kumar V.S. (2005), Recognizing Opportunities for Mixed-Initiative Interactions based on the Principles of SelfRegulated Learning, in: Workshop on Mixed-initiative interactions for Problemsolving. Arlington, VA, AAAI Fall Symposia. Brokenshire D. & Kumar V. (2009), Learning models of self-regulated learning, in: Proceedings of the International Conference on Artificial Intelligence in Education (AIED 09), 257-264. Felder R.M. & Silverman L.K. (1988), Learning and teaching styles in engineering education, Engineering Education, 78 (7), 674-681. Kolb D.A. (1984), Experiential learning: Experience as the source of learning and development, Englewood Cliffs, New Jersey, Prentice-Hall. Honey P. & Mumford A. (1982), The manual of learning styles, Maidenhead, Peter Honey. Coffield F., Moseley D., Hall E. & Ecclestone K. (2004), Should we be using learning styles? What research has to say to practice, London, Learning and Skills Research Centre/ University of Newcastle upon Tyne. 2011).Carver C.A., Howard R.A. & Lane W.D. (1999), Addressing different learning styles through course hypermedia, IEEE Transactions on Education, 42 (1), 33-38. Popescu E. (2008), Dynamic adaptive hypermedia systems for e-learning, Ph.D. Thesis, Romania, Université de Craiova. Tseng J.C.R., Chu H.-C., Hwang G.-J. & Tsai C.-C. (2008), Development of an adaptive learning system with two sources of personalization information, Computers& Education, 51 (2), 776-786. Brusilovsky P. (1996), Methods and techniques of adaptive hypermedia, User Modeling and User-Adapted Interaction, 6 (2-3), 87-129. García P., Amandi A., Schiaffino S. & Campo M. (2007), Evaluating Bayesian networks’ precision for detecting students’ learning styles, Computers& Education, 49 (3), 794-808. Bakeman R. & Gottman J.M. (1997), Observing Interaction: An Introduction to Sequential Analysis, 2nd edition, Cambridge, University Press, Cambridge. Graf S. (2007), Adaptivity in learning management systems focussing on learning styles, PhD thesis, Vienna University of Technology. Web-OSPAN (2010), URL: http://kinshuk.athabascau.ca/webospan (accessed on 24 August, 2011). Graf S. & Kinshuk (2010), Using Cognitive Traits for Improving the Detection of Learning Styles, in: Workshop Proceedings of the International Conference on Database and Expert Systems Applications (DEXA 2010), 74-78, IEEE Press. Robbins S.B., Lauver K., LeH., Davis D., Langley R. & Carlstrom A (2004), Do psychosocial and study skill factors predict college outcomes? a metaanalysis, Psychological Bulletin, 130, 261-288.